What is the Informant 2 Leak Detector Good For? “We turned on the AC system and it didn’t work; so, I paid a guy to charge it up about two weeks but it is out again,” does this sound familiar? You explain to them why charging a leaking system is like continually inflating a tire with a nail in it, and convince the homeowner to fix their system the right way. “How long is it going to take”, they ask. The answer to that question depends on the equipment in your truck. Let’s take a look at the Bacharach Informant 2 Dual Purpose Leak Detector. The Bacharach Informant 2 Dual Purpose Leak Detector detects all CFC, HFC and HCFC refrigerants, including but not limited to R-12, R-22, R-134a, R-404A, R-410A, R-502, R-507, HFO-1233zd, HFO-1234yf and HFO-1234ze. What really sets the Bacharach Informant 2 apart is that it doubles as a combustible gas detector. In a matter of seconds the Informant 2 can be changed from detecting refrigerants to combustible gases by simply swapping sensor tips. This makes the Informant 2 a versatile tool to have in your HVAC arsenal and makes switching between initial gas heat calls and late season A/C work a breeze. The Bacharach Informant 2 has an ergonomically designed neck to give you access in hard to reach places that leaks like to hide and allows for easy storage. The most impressive feature of the Bacharach Informant 2 Dual Purpose Leak Detector is its patented capability to be instantly converted from a refrigerant detector to a combustible gas detector in a matter of seconds. This feature is convenient and puts money back in your pocket by eliminating the need to invest in two separate leak detectors. It has an automatic zeroing function allowing you to pinpoint a leak in an area where the target gas is already present. Automatic zeroing, the Informant 2’s high level of sensitivity, and LED indicators are features common to other high-quality leak detectors in this price range. This shows that the Informant 2 is not just valuable because of its dual use, but is on par with its competition in the quality of leak detection ability. This Leak Detector takes only ten seconds to warm-up. Some competing detectors and methods of leak detection can take several minutes to hours! It's a tool that can save you time because of its versatility and thoughtful design, and we all know time is money in this business. The Bacharach Informant 2 Dual Purpose Leak Detector is powered by 4 - AA batteries. This is listed as a con because it requires you to keep extra batteries on hand. Buying batteries, as opposed to using a charger, is an extra expense to consider. On the other hand, it could be argued that it’s a “pro” when compared to stopping mid-job to recharge the unit or be restricted by a cord for the remainder of a job. Another drawback is that it does not come with a magnetic hanger like some of its competition. This feature is one that would come in handy in the field and can make life easy when working in a tight spot. 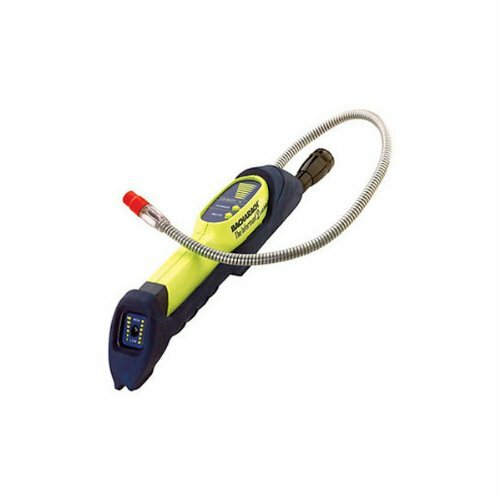 The Bacharach Informant 2 comes with color-coded detector probe tips for both refrigerants and combustible gas sensors, a rubber boot, instruction manual, 4 AA batteries, 5 filters and a hard carrying case. Its versatility makes its pricing attractive because you are eliminating the need to buy a separate meter for detecting refrigerant or combustible gas. The Informant 2’s features are on par with other refrigerant detectors in its class - making it a smart buy for any level of HVAC technician.